At least 70 people have fallen ill in China after eating pork products contaminated with an illegal animal feed additive, state media report. The victims were treated for stomach ache and diarrhoea in Guangdong province, according to the China Daily. Three people remain in hospital. The tainted pig organs contained the drug clenbuterol, which is used to prevent animals gaining fat. It is the latest in a series of food poisoning cases in China. Officials in the southern province are quoted as saying three people have been detained on suspicion of involvement in raising and selling the contaminated pigs. The pork was brought last week from markets in Guangzhou, the provincial capital of Guangdong, and came from farms in the neighbouring Hunan province, according to the report. Clenbuterol is banned as a food additive because it can be fatal for humans. The drug is given to treat asthma and has been used illegally by athletes to build muscle. 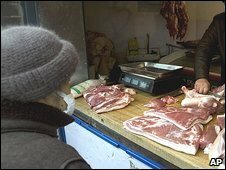 The BBC's Chris Hogg in Shanghai says it seems a lack of proper safety enforcement has again allowed contaminated pork into China's food chain. In 2006, more than 300 people fell ill in Shanghai after eating pig meat or organs that had been contaminated in a similar fashion. Meanwhile, milk contaminated with the industrial chemical melamine was last year blamed for the death of six children and making some 300,000 sick. Two people were sentenced to death for their involvement in the contamination. The former boss of the dairy at the centre of the milk scandal was imprisoned for life. Our correspondent says ensuring food safety is difficult in a country where many small scale operations are struggling to deal with rising costs and tempted to cut corners.